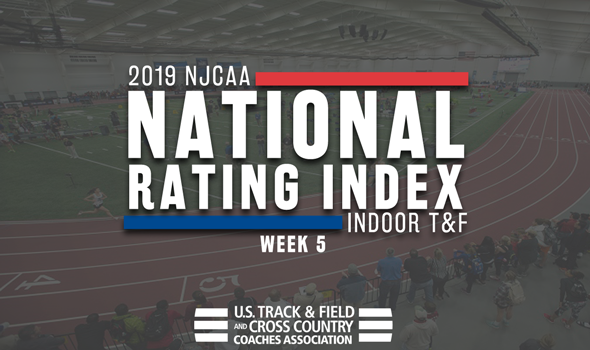 NEW ORLEANS – The postseason is in full stride now as teams across the country are gearing up for a run at the national championship, which brought slight change to the latest edition of the NJCAA Indoor Track & Field National Rating Index that was released by the U.S. Track & Field and Cross Country Coaches Association (USTFCCCA) on Wednesday. While the rating experienced a good shake up overall, the top teams in the country on the men’s and women’s side remained the same for the fourth consecutive week as the men from Cloud County (Kan.) CC and the women from Barton (Kan.) CC are the current favorites to capture the national crown. The 2019 NJCAA Division I Indoor Track & Field Championships will take place March 1-2 in Pittsburg, Kansas. For the fourth consecutive week, Cloud County (Kan.) CC is the top team in the nation. The T-Birds are fresh off a victory at the Region VI Championships, the program’s first since moving from the old Prairie Junior College Conference years ago. Top performances of the meet came from Louis Humbert (now second in the nation in both the pole vault and the heptathlon) and Peter Ackah (sixth in the triple jump). Overall, the group added 17 new marks to the index ratings. It is the longest streak at the No. 1 spot in program history. Jumping up one spot to No. 2 was Barton (Kan.) CC after finishing as the runner up at the Region VI Championships. The Cougars added 19 new marks to the Index and were led by Stephon Torrence (first in the country in the 60H), Nathan Hod (second in the 1000 and third in the 600), Kevin Nedrick (second in the shot put), Alencar Pereira (second in the weight throw), Davonte Burnett (third in the 200 and sixth in the 60) and Tahj Whitfield (fifth in the heptathlon). Also climbing up a spot to a program-tying No. 3 was Coffeyville (Kan.) CC. The Red Ravens placed third at the Region VI Championships and had 20 performances from the weekend added to their index rating. Standout athletes from the weekend included Chris Banks (leads the nation in the high jump), Dodley Thermitus (first overall in the long jump), Darius Clark (second in the long jump), Brian Pittman (third in the triple jump) and Brandon Patterson (third in the shot put). The program’s 4×400 team also posted the fourth-best performance in the nation this season. Dropping two spots to No. 4 was Iowa Central CC. The Tritons blew out the field at the Region XI Championships as they captured the title with 302 total points, 187 more than the next closest program. With the performance, Iowa Central CC added 13 new marks to the index as the group was led by Courtney Lindsey (second nationwide in the 200 and fourth in the 60) and Tyler Lineau (fourth in the weight throw). Holding steady was No. 5 South Plains (Texas). The Texans spent the past weekend at the Texas Tech Matador Qualifier and added seven new performances to the ratings. The group was led by Holland Martin (fourth in the country in the triple jump) and Deion Lightfoot (sixth in the 60H). The top-10 was rounded out by Western Texas, Central Arizona, Colby (Kan.) CC, Monroe (NY) and Indian Hills (Iowa) CC. Barton (Kan.) CC is once again the top team in the nation, a position the program has held for four weeks in a row. The Cougars most recently won the team title at the Region VI Championships over the weekend. Overall, Barton (Kan.) added 19 new marks to the index as they were led by Yoveinny Mota (tops the nation in the 60H), Christal Mosley (third in the 400), Cadeebra Calcote (third in the 600) and Arianna Haude (fourth in the pentathlon). It is the longest consecutive streak spent atop the country by the Cougars. Climbing up one spot to No. 2 was New Mexico JC. The Thunderbirds were at the Texas Tech Matador Qualifier this past weekend as a final tune up against Division I athletes before the NJCAA Championships. Twenty-three new marks were added to the Index overall for the program with top performances coming from Monique Grant (now the nation’s best in the pentathlon) and Raheema Westfall (third in the 200). The groups 4×400 is also second in the nation while the 4×800 is now slotted at third overall. Flip-flopping with them was No. 3 Monroe (N.Y.). The Mustangs were at the Fastrack Last Chance meet and posted five new marks to their rating. The group was led by Claudrice McKoy who is now second in the country in the 1000. Jumping up a spot to No. 4 was Cloud County (Kan.) CC. The T-Birds placed second at the Region VI Championships this weekend, falling to top-ranked Barton (Kan.) CC by 54 points. The program had 16 marks from the championship meet make its way into the ratings with top athlete honors going to Grace Chinonyelum (now leads the country in the triple jump) and Jacqueline Pokuaah (second in the long jump). Rounding out the top-5 after dropping a single-spot was No. 5 Iowa Central CC after the program won the the Region XI Championships. The Tritons posted 11 new marks that were added to the index including the one by Maddie Schmoker as she is now fifth overall in the weight throw this season. It was the 14th consecutive year that Iowa Central CC captured the regional crown. The rest of the top-10 was completed by South Plains (Texas), Central Arizona , Cowley (Kan.), Western Texas and Iowa Western CC.